A Walmart store, allegedly and reportedly in Evanston, Indiana put up a display of rifles touting them as part of their going back to school marketing. How odd. How disturbing. A woman took a photo, it went viral, and voila- we have the gun rights culture out front and center for the bold and clueless treatment of guns. The linked article reports that Walmart apologized and the display was taken down but also wondered if it was a fake photo or doctored in some way. Both cannot be true and the mystery remains. But why go there at all? The thing is, it’s so believable that there would be a marketing display of this sort that naturally people were upset. In the midst of all of the heinous shootings involving kids and the thought of one’s own child as a victim of a school shooting or the shooter for that matter, why go there? The answer is… gun rights. What is odd about that display anyway? Isn’t it normal for guns to be marketed like this to increase sales? Never mind that it might be offensive to many. Many are not only offended but many have experienced gun violence in their lives. Shooting anniversaries come and go and it’s one more year since the death or injury of a loved one. Yet another such shooting anniversary occurred with little notice. In 1999 a White Supremacist with hate in his heart and on his mind decided to shoot at kids and teens at a Jewish Community Center day care in L.A. Five were wounded after 70 shots were fired. It’s quite amazing that more people weren’t injured or killed. The children of two friends were among the wounded. These are mothers I have met through my network of gun violence prevention advocates. The son of one of them, only of pre-school age has now grown into a wonderful young man with nothing but some physical and emotional scars left. The other was a teen girl who is now happily married and doing fine. But the feelings never go away and the scars and memories are still there. The horror of the phone call that your child has been shot lives just below the surface. It was this shooting that motivated Donna Dees Thomases to start planning what has become one of the largest marches on the National Mall- the Million Mom March. which took place in May of 2000. And the movement continues. Activists and advocates lobby, march and organize still today for non-violence and common sense solutions to gun violence. Speaking of common sense solutions to violence, how can we hope that will happen when white supremacists gather together to foment hate, racism and intolerance. But that is what they will do this week-end in an alt-right rally in Charlottesville, Virginia. Thomas asked that protesters from both camps to pledge to remain nonviolent. Yet, yesterday, Trump’s deputy assistant and counterterrorism adviser, Sebastian Gorka, ridiculed the idea of lone-wolf terrorists and played down the threat of white supremacist violence. Researchers believe lone wolf attackers are fundamentally different than people who participate in organized political violence. In an effort to better understand the phenomenon, the Department of Justice has funded two groups of researchers to compile databases of historic lone wolf attacks, so they can be analyzed for trends, psychological profiles — and, the authorities hope, insight into how to prevent them. We all know that Donald Trump changed his views about gun policy as he was seeking to be our President. Of course he did. Follow the money and power. As an aside, our President has changed his position on many issues and one doesn’t know what will come out of his mouth at any given moment. Lies, #fakenews, incendiary rhetoric, ramping up war rhetoric, blaming others, bullying others, criticizing his own “friends” and allies, throwing people under the bus for his own expediency and blurting out mistruths that could end us all up in a lot of trouble. It is not only odd but disconcerting and quite scary. But I digress. It does no good to ignore or deny that these kinds of attacks take place. The shooters are most often angry men and often known to have mental illness. And they have access to guns because… it’s America where gun rights trump the right of all of us to be safe from attacks by people wielding guns in order to hurt others. Ignoring and denying that these incidents happen gives an excuse for doing nothing about them. In the early years, a high percentage of lone wolf attacks employed explosives. But that has changed: “The lone wolf’s preferred weaponry is now a staggering range of high-velocity firearms,” Hamm and Spaaij write. They attribute this trend to controls on the purchase of bomb-making materials enacted after the Oklahoma City bombings in 1995 and the permissiveness of U.S. gun laws. “Permissiveness of U.S. gun laws…” This is the truth but the gun rights extremists want our laws to be even more permissive so that anyone can buy and carry guns everywhere. This is not normal. It is odd compared to almost all other democratized countries not at war. When the commander in chief keeps changing his own mind about guns and gun policy and ramping up fear and paranoia, of course we have more violent and intolerant rhetoric. The gun culture we have is not the gun culture we should have. There is no reason why we can’t all work together to at least try to stop some of the shootings. Changing the conversation and working towards making guns accessible only to those who can reasonably handle them and are not under the category of felons, domestic abusers, known terrorists ( on the terror no-fly list), adjudicated mentally ill, drug abusers, or potentially dangerous to themselves or others would save lives. That should not be so difficult. It’s all about common sense. A Kansas City 5 year old is dead by his own hands when he found a gun in his home and shot himself. Without the kind of discussion, research, common sense measures to prevent shootings and whatever it takes to stop this irresponsible gun behavior we can expect our children to continue to suffer from gunshot injuries and deaths. Craft illegally came into possession of the handgun, according to Gulfport police Chief Leonard Papania. The teen has been charged with manslaughter. How do 16 year olds access guns? That question must be asked and answered. They should not have guns, period. But this is gun rights in America. Solutions can be found if we have good research into the problem, talk about the risks of guns in homes, attack gun trafficking, lost and stolen guns, straw purchasing and require Brady background checks on all gun sales. Today, 19 children will die or receive emergency treatment for a gunshot wound in the U.S. And tomorrow, another 19 will. And then another 19 the next day. In fact, 91% of all children who die from firearms in high-income countries across the world come from the United States, and guns are the third leading cause of death for all children between ages 1 and 17. Those are a handful of the sobering statistics reported in a new study on gun violence in Pediatrics. Yes. We have gun rights and we also have gun rights myths. Guns are killing us and most especially, our children. This is not OK. It’s odd. It’s not normal. We can do something about it if we stop the denial and raise our voices. It doesn’t have to be this way. Young children should not die from gunshot injuries, robbing them of a future and their families of watching them grow up to contribute to society. Young children dying from gunshot injuries should be rare and odd. Try ASKing if there are loaded unsecured guns where your children play and make sure you, yourself lock your guns away, unloaded, from curious hands or from theft. A 4-year-old boy is in serious condition after he was shot in the head in an apparent road rage incident overnight in Cleveland, Ohio, the Cleveland Police Department said. Police said the shooting happened while a mother was driving her 4-year-old son and 7-year-old daughter. After the mother honked her horn to pass another car blocking the road, that car allegedly followed the mother onto the freeway and fired shots into the woman’s car, police said. What is wrong with us? Why are people driving on our roads armed? What is so dangerous out there to warrant this kind of behavior? This is a gun culture gone wrong. A friend posted a photo on her Facebook page of a man open carrying at a dog park to which she took her dog. She had never seen someone open carrying a loaded gun before and found it odd. It is. It’s not normal. Others on her Facebook page were not aware that people can open carry guns in many states and were upset and disgusted to see this photo. People don’t like seeing armed citizens around where they go to work, play, learn, worship and hang out. Commenters on her page wondered what is so dangerous at a dog park? Will the man have to shoot another dog? Will a dog owner make him angry? Will that gun “accidentally” fall off of his belt (not sure how gun is attached to belt) when he leans over or chases the dog? There are no “accidental gun discharges but nevertheless they happen. I write about these incidents too often and they should be odd. Why aren’t they? I have posted this photo with permission from my friend. Should this be normal? A minority of Americans practice their gun rights by carrying concealed or openly. So far instances of having to use carried guns for self defense are rare compared to the risk of having guns around in the home. But the reason given by many gun rights activists is that they must own and carry their guns for self defense. A pistol-packing senior tried to reserve a parking space in Queens Wednesday by firing off a few rounds. Yvonne Cosby, 76, let off two gunshots from the window of her Brookville home because she was angry that a man had parked outside her house, cops said. Miraculously, Cosby missed her target. Police were eventually able to calm her down and take her into custody, cops said. 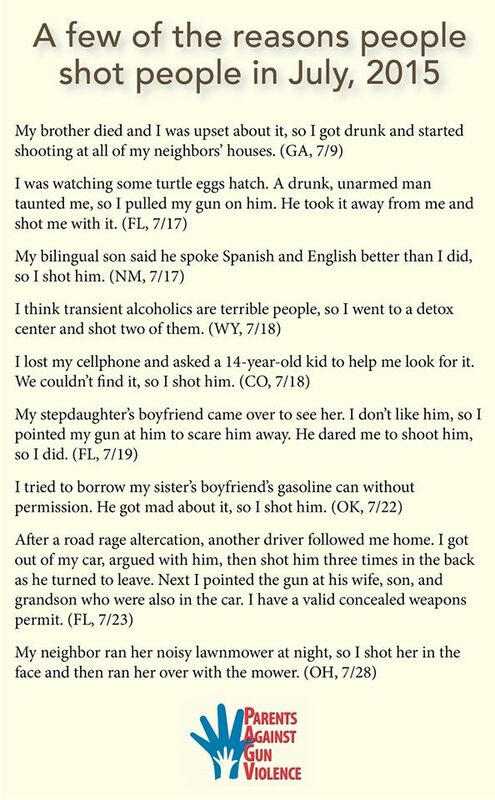 It’s very clear that some people should not have guns. We need to re-think the idea that just anybody can pack heat and have a gun for “self defense”. This woman’s family will now hopefully understand that she is dangerous to herself or others and should have her gun removed from her home. There is something wrong with a gun culture where there are almost more guns than people. And to make it worse gun ownership has gone down and now fewer people own more guns per person. Normal? There is something wrong when gun deaths happen at such a rate as to be a national public health epidemic that we ignore and deny at our peril. There is something wrong with idolizing guns and gun rights to the point that we dare not challenge it or those who believe in the myths. Gun rights and gun responsibility along with sensible gun laws can go hand in hand. They are not mutually exclusive. Since most gun owners agree with this, we ought to be on our way to sensible solutions, right? There is nothing funny about it. In the end, this is about saving lives and need not set gun rights against the right to be free from devastating gun violence. Sadly, as predicted, violence has broken out at the “alt-right neo-nazi rally in Charlottesville, VA. The Governor has declared a state of emergency. A group of three dozen self-described “militia” – men who were wearing full camouflage and were armed with long guns – said they were there to help keep the peace, but they also did not break up the fights. Tensions began Friday night, as several hundred white supremacists chanted “White lives matter!” “You will not replace us!” and “Jews will not replace us!” as they carried torches marched in a parade through the University of Virginia campus. Very frightening. Where do we live? This is America but then again, this is not America. Stinchfield later deleted the tweet and then apologized. NO. It was not meant as a joke. He got caught. He meant it and it’s NOT FUNNY. Just as President Trump claimed that it was a good thing that Putin cut all of those embassy jobs because they were trying to cut the State Department budget and later tried to claim that it was satire. NO. It was NOT SATIRE. He meant it. Apparently he also told the Governor of Guam that this tough talk would be good for tourism there as well. NOT SATIRE. Stupid and dangerous talk. NOT. We’ve had it with this hate, intolerance, paranoia and threats of violence. This is not who we are. 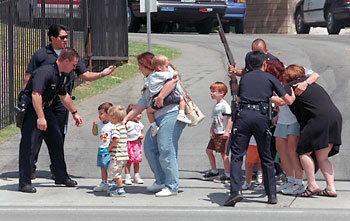 15 years ago today, a White Supremacist shot up a Jewish Community Center day care center and injured small children. This is the shooting that caught the attention of Donna Dees Thomases who then went on to organize the Million Mom March in May of 2000. 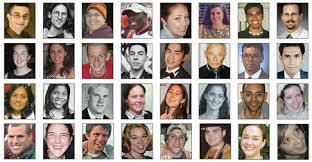 Since that time, thousands of Americans have been involved in the issue of gun violence prevention. And since that time, about 200,000 more Americans have died from gunshot injuries with Congress taking the back seat instead of driving the conversation that we need to have. And so , the American gun culture keeps giving us shooting after shooting, mass shooting after mass shooting, and more dead and injured citizens. Americans are numb to the carnage because it is happening too often. People feel helpless to do anything about it since our politicians are so afraid to take the bully pulpit they have and speak out for change. Let’s take a glimpse at what went on in our country over the past few days if you don’t believe me. A shooting in a small North Carolina city is the epitome of the American gun culture. A young father, drunk, shot and killed his two young sons and then himself. In reading the story, several things jumped out for me. The man told neighbors he was paranoid about someone breaking into his house. He was constantly shooting guns in his back yard, bothering and frightening the neighbors and often while drinking. Are there laws about stuff like this? Can people shoot off their guns in the city limits? If so, why? If not, why didn’t someone call law enforcement? Should this man have been allowed to have guns? Shooting while drunk just has to be against some law- reckless endangerment? Or is this just an example of the gun culture we have that people are willing to accept this dangerous and stupid behavior? Now 2 innocent little children are dead. Senseless. Avoidable. Several studies have established the relationship between alcohol abuse and firearm-related crimes. Just as an individual is severely handicapped while operating a car under the influence, these studies found that similar failures in judgment and impulse control manifest during the operation of a firearm. Research shows that the risk of homicide, suicide, and violent death by all causes is significantly elevated with chronic alcohol abuse. Another studyfound a causal relationship between alcohol abuse and “impulsive” crimes such as assault and property damage. Garen Wintemute, a professor of emergency medicine who runs the Violence Prevention Research Program at the University of California, Davis, has conducted two recent studies on alcohol use among gun owners and how it might impact their behavior. In 2011, using data from the Behavioral Risk Factor Surveillance System — an annual survey of risk-related behaviors conducted by the Centers of Disease Control — for eight states and more than 15,000 respondents, he found that gun owners are significantly more likely than non-firearm owners to have five or more drinks on one occasion, to drink and drive, and have 60 or more drinks per month. Our country is awash in guns. It’s inevitable that a father who has abused alcohol and is fascinated with guns, will eventually shoot and kill people he loves. It happens. It doesn’t have to but in our American gun culture the unspeakable happens. This past week-end there were several mass shootings not being talked about by national media. A Texas man who shouldn’t have had a gun got upset when an ex partner changed the locks on the house. That’s a good reason to shoot and kill 8 people right? Why not? Guns are dangerous weapons designed to kill other people. And kill they do. Guns in the hands of guys like this are more than dangerous. Given that this guy had a record and was likely on the prohibited purchasers list, how did he get his gun? This is the American gun culture. Sobel was shot and killed after work Friday outside a state office building in Barre. She handled a case for the state Department for Children and Families in which Herring lost custody of her 9-year-old daughter, authorities said. The person in the quote needs only tune in to the national media to find out that 4 people are killed by the same alleged perpetrator all the time in this American gun culture. Arguments about who owns a $20 dresser resulted in a shooting incident in Oklahoma- with an AR-15 for goodness’ sake. 3 people are dead in a presumed domestic shooting in Kileen, Texas. On Monday, Attorney General Loretta E. Lynch denounced the shootings, saying that “violence obscures any message of peaceful protest and places the community, as well as the officers who seek to protect it, in harm’s way. And this, too, is the American gun culture. Young people with guns are in our neighborhoods shooting each other, shooting innocent people, shooting at police officers. Young people with guns obtained illegally most likely. Police officers are outgunned on our streets and sometimes overreact to the young people, some unarmed- some armed. And it seems that most of this is happening to black youth. We cannot ignore this gun culture. It is killing our young people of all colors but mostly young black youth. It is a national tragedy that we are not addressing. It’s an issue of racial injustice and racial disparity. And it is an issue of too many guns accessible to people who should not have them. Though I am not addressing gun suicides and “accidental” shootings in this post, those, too, are all part of our American gun culture. This is not a culture of which we should be proud. It should be a national embarrassment that we are not addressing like other countries have done in the face of a public health and safety problem. Is the epitome of our gun culture dead children? Small children being led across a street in a human chain after a crazed gunman tried to kill them? Drunk people firing off their guns in their yards every day? An angry woman shooting 4 people over losing custody of her child? An angry domestic abuser shooting 8 people because of a change of a door lock? Young black kids being shot by police officers? Police officers outgunned on our streets? Stolen guns leading to crime guns used in shootings? Someone shooting off an AR-15 over a $20.00 dresser? PSTD suffered years after being shot at a day care center by a mad man? What is the cost of our American gun culture? Donna was right. We weren’t doing enough to prevent the daily shooting incidents. When small children are attacked by a crazed gunman in a pre-school, something was ( and is) wrong with our American gun culture. Not long after the shooting incident at Granada Hills Jewish Community Center where young children were injured, the Columbine shooting happened. And then the shooting of 5 year old Kayla Rolland. They just kept coming and it was more than enough to get 750,000 plus Americans involved in one of the nation’s largest rallies on the Washington Mall. We marched and we organized and we had hope. And then we learned that trying to break through the entrenched corporate gun culture was an uphill battle. We have had occasional victories, the latest of which is the passage of a new background check law in the state of Oregon. We will continue working on passing stronger gun laws and countering the craziness of the corporate gun lobby. Why? Because lives depend on our staying the course and being there to get out the message that too many have died from gun violence and that we can save lives if we put our collective heads together to change the national conversation and tell the truth about the devastation of gun violence in our communities. In another article about the anniversary, Donna and other advocates talk more about the movement and about plans for the future. When I started this 15 years ago, 10 kids a day died from gunshot injuries. The number today is closer to 8. That is an improvement. But it’s not acceptable. What other public health epidemic gets treated like gun violence? It’s all about the fierce opposition of the corporate gun lobby and it’s bought and paid for politicians. That has not changed in the 15 years since the Million Mom March. But never mind. We will continue working on safe storage, on getting parents to ASK if there is a gun where their children play and hang out, on laws to stop bad apple gun dealers from providing guns to dangerous people and to make sure all gun sales go through a Brady background check. For this is the country most people want. It’s not what we have or deserve. Thanks to Donna Dees -Thomases and the many Million Mom March and Brady chapters all over the country for their devotion to this important cause. Thanks go to all of those politicians who have had the courage to speak up for common sense. Thanks to the physicians, lawyers, clergy, community activists, like minded groups, friends, families of victims and survivors for their willingness to support what we do. And thanks to those who have followed in our footsteps to make our country safer.